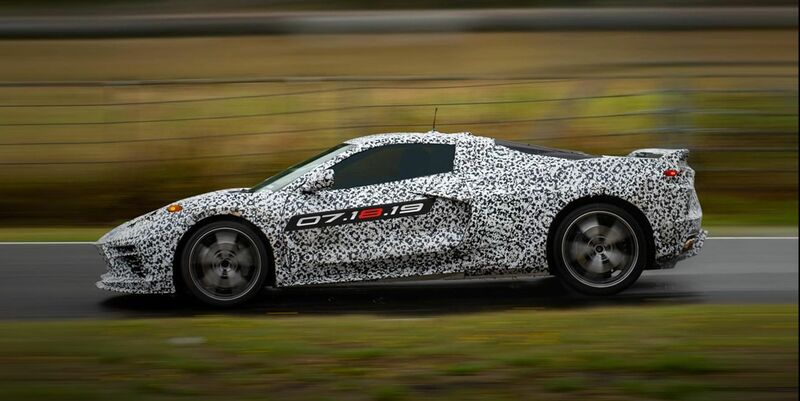 While GM will remain silent on the specifications of the mid-engine Corvette until the reveal, given all of the rumors floating around, we can expect the new C8 to debut with an LT2 V8 engine putting out around 500 HP and mated to a dual-clutch seven-speed automatic Tremec transmission. At the time of this writing, unfortunately, that transmission is expected to be the only transmission to be offered. While I understand the advantage of today’s automatic transmissions, there’s just nothing like manually rowing through the gears and being truly one with an automobile. With any luck, GM will offer a manual transmission for those of us out there that still truly enjoy the art of sportive driving and don’t care as much about 0-60 and quarter mile times. At 6:27 pm tonight, GM officially confirmed on social media, that the mid-engine Corvette will be revealed on July 18th. The first saleable production units are expected to hit the ground at Chevrolet dealerships late December of this year to January of 2020. To all of the naysayers out there who kept saying it will never come, or it’s a Cadillac sports car, or “I’ll believe it when I see it…”, you’re about to eat crow! Along with the official announcement, GM has released a press release announcing that the final C7 Corvette to be built, a black 2019 Z06 Corvette, will be auctioned off by the Barrett-Jackson Auction house to benefit the Stephen Siller Tunnel to Towers Foundation.